We're proud of you. You should be, too! 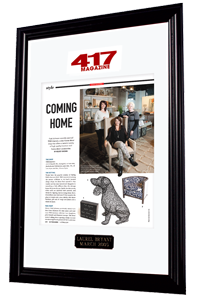 A custom frame highlighting your 417 article is the perfect way to enhance the reach of your business by showcasing your story in your lobby or office. Includes 417 flag, nameplate with your name/business name and the issue date. Questions? Please contact Janelle Haik at 417-883-7417 or janelle@417mag.com. Please allow 6 to 8 weeks for delivery. We accept cash, check, Visa, Mastercard and Discover. Orders will not be processed until payment is received.